Don't fret that you missed out on the Missoni merch at Target, because you can make your own Missoni garments! Hurry over to Elliott Berman Textiles NOW while they still have Missoni fabric in stock and tell 'em Shop the Garment District sent you. Better yet, call first to check availability (212-764-0180). Just don't wait because this stuff is yummy and is going almost as fast as Missoni did at Target. I grabbed two yards to sew up a cardigan for moi, moi, moi. Even if Missoni is not your thing, do head over to EBT because they have so many new fabrics in from Europe: beautiful brocades, jacquards, wools, silks, knits from the finest fabric houses. The only downside is that they have so much fabric in-house I am afraid Mathew and Eugenia may get trapped in a fabric avalanche. Let's all encourage them to look for more space, shall we? This Missoni knit comes in several different colorways and is so soft. This Missoni fabric is a little heavier and would make a great sweater-coat or jacket. Check out designer and ardent Garment District supporter Nanette Lepore's new Tumblr blog, where she shares glimpses of her work and personal life, plus her takes on "hidden gems in the Garment Center." I normally keep my personal sewing adventures off this site, because it's really about the stores and the services here in the Garment District, but I couldn't resist sharing my first attempt at sewing a leather tote. 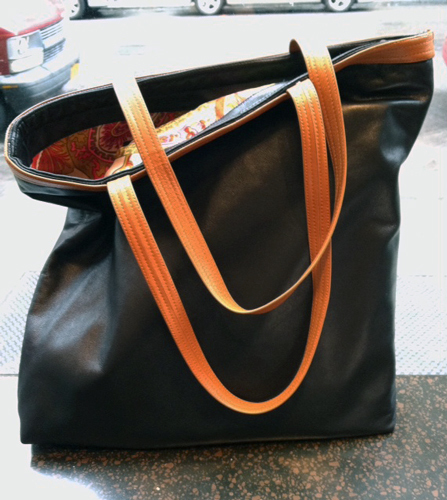 Introducing my "NYC Garment District Magazine Tote." It's soft, pliable, and just the right size for carrying home all the international fashion magazines I pick up at Around the World Magazines on W. 37th Street. I deliberately kept it very simple so I could throw it in my office file drawer without it clinking and clanging from a lot of hardware. This bag was completely homegrown here in the Garment District. The black lambskin and British tan leather trim came from Leather, Suede, Skins on W. 35th. The paisley silk lining is Milly and came from Elliott Berman Textiles on W. 35th. 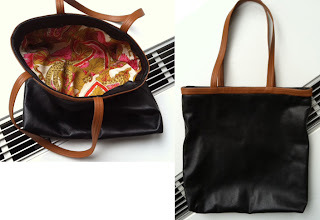 This was so much fun to make I think I see more leather totes in my future…. Interested in breaking into the handbag business? Check out Handbag Designer 101, founded by local success story Emily Blumenthal. Leather, Suede, Skins on W. 35th will cut leather or suede fringe to your specifications, and affordably so? according to this week's cover profile in New York magazine, It Girl (and Williamsburg resident) Zooey Deschanel likes to sew her own clothes? Wonder where she shops for fabric…. Scroll down on the right column for Facebook and Twitter info. Have a great weekend! Want to learn the secrets of the garment district? Come on a "Speakeasy" Tour! welcome to "shop the garment district"
This is the place for everything about the fabric, trims and notions stores and shops of New York City's famed Garment District. Within just a few square blocks of NYC you can find exquisite designer fabrics, bargain bolts, trims worthy of a Chanel jacket, oodles of buttons and buckles, all kinds of dressmaking supplies, and so much more. "Shop the Garment District" features store info, news, tips, tidbits and much more! Follow @ShopGarmentDist If you've made something fabulous using supplies from the garment district, TWEET me a picture! Do not use any of the content herein without seeking my permission first. Copyright Mimi Jackson 2012-17. All rights reserved. Simple theme. Theme images by gaffera. Powered by Blogger.